Ander Negrazis is a Registered Psychotherapist with the College of Registered Psychotherapists of Ontario (CRPO). 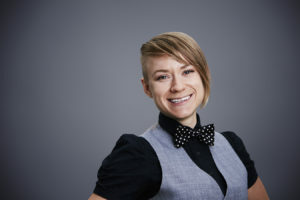 They earned their Master’s degree in Counselling Psychology from the University of Toronto, where their research and practice focussed on supporting queer, trans/non-binary and questioning clients, clients with disabilities, and developing arts-informed approaches to communication, learning, and relationship. Ander is a queer, non-binary person with a disability, community organizer, and artist who brings over 15 years of experience in community organizing, community arts, and popular education to inform their therapeutic approach. Ander draws together Emotion Focussed, Relational, Cognitive Behavioural, Creative, and Narrative therapies rooted in anti-oppressive, anti-racist, accessible, trauma-informed perspectives. Their therapeutic manner is affirming, collaborative, and encourages curiosity; an approach that nurtures and cultivates creative problem-solving and critical questioning. Learning and Disability (specific to clients with learning disabilities facing barriers to mental health, neurodiverse clients, and also clients with mobility and communication disabilities). Ander takes a non-pathologiaing community psychology perspective on mental health, which views a person’s well-being as inseparable from the well-being of communities and involves building accessible community spaces to address barriers to access. In addition to their work at Umbrella, Ander is a co-founder and co-director of a non-profit arts organization dedicated to running free and accessible studio spaces, educational programming, creativity coaching, counselling, and leadership development for artists with disabilities.